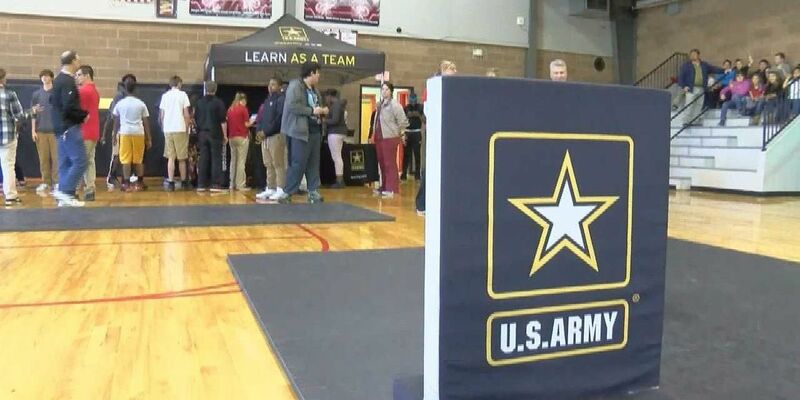 LUMBERTON, MS (WDAM) - The U.S. Army's "High School Challenge" has been touring the country visiting area schools before stopping in Lumberton Wednesday. The event offered various obstacle courses requiring physical problem solving through cooperative efforts. The program is designed as a hands-on event that provides students the opportunity to put their leadership skills to the test. Mason Smith, a teacher at Lumberton High School, said the program not only helps kids with developing team skills, but it also prepares them to overcome future obstacles they may have to overcome in order to reach their career goals. "This is a wonderful opportunity for students to work together and it really enhances the learning environment, it give them the opportunity to work together as a team." Smith said. "It gets them outside their comfort zone and step into a new arena that may give them a greater opportunity in the future to be successful." The program is aligned with core Army values and objectives, specifically STEM (science, technology, engineering and math), teamwork, leadership, adaptability and versatility. The layout and formal execution of the "High School Challenge" is what binds the overall experience. Ultimately, the "High School Challenge" raises awareness with prospects in regard to the available career options.